If you’re anything like me then you’ll be addicted to straightening your hair and I am that person! Blessed with super curly and usually frizzy locks it’s my aim to have smooth and sleek hair with minimal damage. I’ve spent years using hair straightening irons and I’m afraid I’ve really fried the ends of my hair. It was so split that I went to my hairdresser and had three inches cut off so it’s now just touching my shoulders. 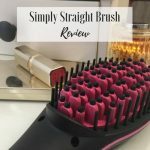 Rather than keep using my hair straighteners I decided to try something brand new and with all the straightening brushes appearing on the market I spent some time doing some research. 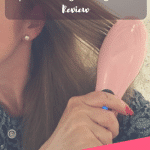 I came across the InStyler STRAIGHT UP Ceramic hair Straightening Brush , a breath of fresh air compared to other branded brush straightener models with very high prices. I have to say this brush has transformed the way I straighten my hair. It’s also cut the time it takes to straighten my hair by around a third and my style really lasts. With traditional straighteners (even the market leader) I used to have to go over my style the morning after which I’m sure didn’t help with the health of my hair. 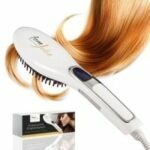 The brush doesn’t work on wet hair, so as with hair straighteners, you need to wash and dry your hair first. To minimize damage, I let my hair air dry and then I get to work! The InStyler looks just like a hair brush except it has a cord which you plug into a power supply. Then you wait for it to heat up. It’s made out of lots of individual ionic bristles. These have that special technology which banishes frizz and smooths out the hair cuticle, this is the key – what achieves the straight and sleek look you look for. The brush heats up and retains its heat but it evenly distributes it so there’s no need to keep going over the same area of hair and neither are there any unwanted hot spots – the parts of your hair that burn. You won’t burn your fingers either because the bristles have a cool tip. With seven different temperature settings to choose from ranging between 330 Deg F to 450 Deg F this brush is suitable for all hair types from fine hair to really thick and unmanageable hair. I do have one negative to report. If you want volume this won’t work for you. Equally if you like to flip your hair out or underneath so it doesn’t look poker-straight, the InStyler doesn’t do this. It does, however, achieve a super-straight, extra sleek look but it’s not for those of you looking for big, bouncy hair. Have you tried the InStyler Straight Up Brush? What’s your verdict?